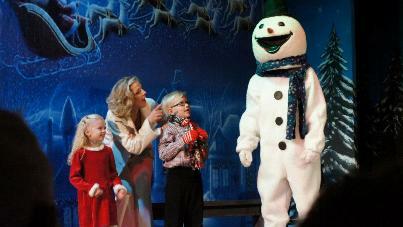 Come celebrate the holidays with Michael Minor and his family in the Michael Minor Family Christmas Show! Tickets: Adults - $15; Children under 12 - $7 First come, first served seating. Back by popular demand, world class singer, ventriloquist and impressionist, Michael Minor, along with his talented wife, Jill and their two adorable children, Noah and Neve, will be here in Palmyra to help you kick off another festive Holiday season! Please join us for a heartwarming, toe tapping celebration of the Holidays. Michael, a classically trained baritone vocalist, will be performing some of your favorite traditional Holiday songs as well as some new popular renditions. Noah and Neve have some numbers up their sleeves that are guaranteed to steal the spotlight from Dad! Jill and Michael will take to the dance floor, and Clarence, the Moose, Guido the Rat, Screech, and everyone’s favorite special guest, Grandpa will be here! This family likes to think of the audience as their family, so don’t be surprised if they grab you for a joke, a dance or even a song. This show will make you laugh, reminisce and celebrate the Holidays!